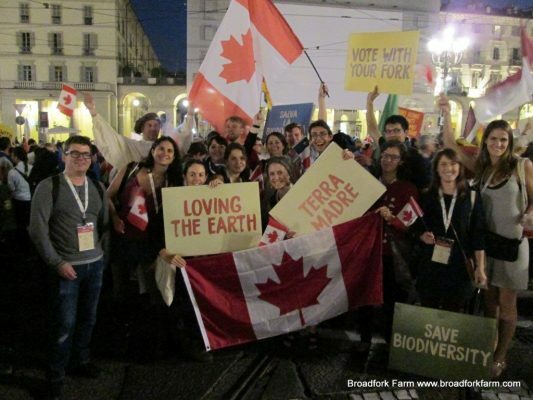 The 11th edition of Terra Madre Salone del Gusto ended on September 26, 2016 four days after seven thousands of delegates from 143 countries, including Canada, reunited to take part in the most important international event dedicated to food and agriculture. 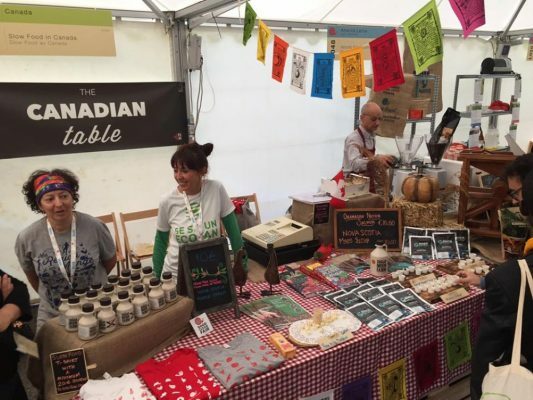 We asked our Canadian delegates to tell us about their experience at Terra Madre Salone del Gusto and to send us some of their favourite pictures of the event that took place in Turin, Italy. I’m not sure that words or even pictures can do justice to our experience in Turin. We really were not sure we could get away in the middle of harvest and didn’t have much sleep in the days leading up to the trip but once we were on the airplane we left it all behind and stepped into a food lovers paradise. We spent time in the market every day and there was always something new to learn and taste and see. Oysters, cheese, pasta, chocolate, tomatoes, cured meats, olive oils, truffles, ice cream, balsamic vinegar. The people of Turin were as excited to show us their city as we were to be there. With the new format opening the doors of the auction house, theatres, museums and restaurants, it was wonderful to be able to explore and see all that Slow Food had put together. We were able to attend forums on raw cheese, women in agriculture, shepherds guarding the land and Egyptian agriculture, past and present. We went to a Canadian food and wine tasting, a shrub and vinegar drinks tasting, an Italian cigars and single rum tasting, a prosciutto and champagne tasting. We met so many wonderful people and had an amazing time. We learned a lot about the great things Slow Food does throughout the world: protecting heritage, giving a strong voice to groups that need an advocate and sharing knowledge to help provide good clean fair food for all. 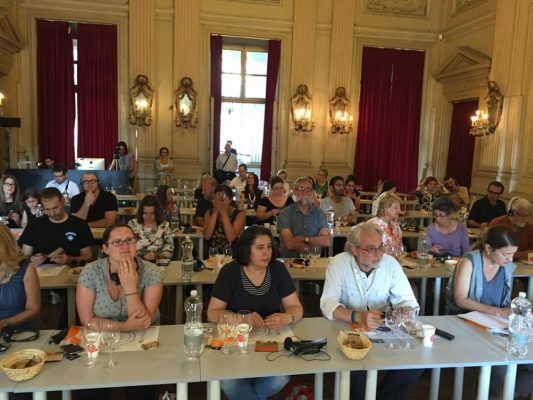 I had such an amazing time at Terra Madre Salone del Gusto! I’m a herbalist and beekeeper. I took some of our mead (honey wine) for a tasting event at the ‘Let it Bee’ space. I was one of five mead producers showcasing our product. I was pleased to find out that our style of mead compares most closely with the Japanese mead that was being sampled. The other three kinds were Italian meads and were much thicker and sweeter than ours. It was interesting to learn a bit about the methods of the other mead makers. I met a wonderful Italian beekeeper in the outdoor market area in Parco Valentino who spoke with me at length about the situation with bees in the world right now. It was sad to hear that Italian and European bees are suffering the same as Canadian and North American bees. One evening, during dinner in the cafeteria, I was fortunate to meet a man from Argentina who is a lawyer working on the International Tribunal against Monsanto. Even though I speak very little Spanish and he spoke almost no English we were able to communicate using hand gestures and a mixture of Italian, French, English and Spanish. We had a wonderful conversation.